Buddy not only plays soccer pretty well, but he fathers 6 puppies. The trio of boy, dog, and girl rescue the puppies from dognappers on the way to the State championship. The pups go on to form their own movie franchise. Highly productive, these soccer dogs. In the last few minutes of the story, the movie switches to a Womens World Cup game between Norway and the USWNT. Briana Scurry, Brandi Chastain, and Tisha Venturini are taking PK’s in a shootout. Briana gets hurt, so Buddy subs in as GK to block the last PK. Kinda bizarre, but maybe your little girls will like that part of the story. As Tisha Venturini points out, before WWC 1999, the movie would have been about boys playing soccer. The soccer in the movie, coordinated by Steve Kirkland, is not terrible. The AR has some funny shots, and the center referee (Jay Brazeau) is huffing and puffing. Miguel Sandoval is very good as the coach. 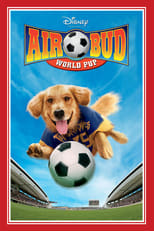 Like so many other kids soccer movies, this one is shot in Vancouver, Canada. The DVD has a Production Featurette where you can watch the WWC scene being filmed and hear interviews with the US Women, the young actors, and the director.